It's Pipe Marking Season! Are you in Compliance? Now that the snow is melting and spring is springing, this is a good time to check your pipes and make sure they are properly labeled. If you discover your pipes are not labeled and you are not in compliance with ANSI/ASME standards, spring is a good time to start your pipe marking projects. The ANSI/ASME A13.1 standard explains the sizes, colors, and placement instructions for pipe markings. Familiarize yourself with this standard. Survey your facility and identify the types of pipes present. For large facilities, consulting a map or diagram may be useful. Include the colors and sizes of all labels you’ll need, as well as their quantities and where they will be placed. You can order pre-printed labels or make labels in-house with an industrial label printer. Select a time when you will least disrupt workers. Employ a team to make large installation projects go more quickly if necessary. It’s time to check your pipe labels! Spring is here, and that means it’s pipe marking season. Time to assess the pipe label situation at your facility and see if it’s time for an update. 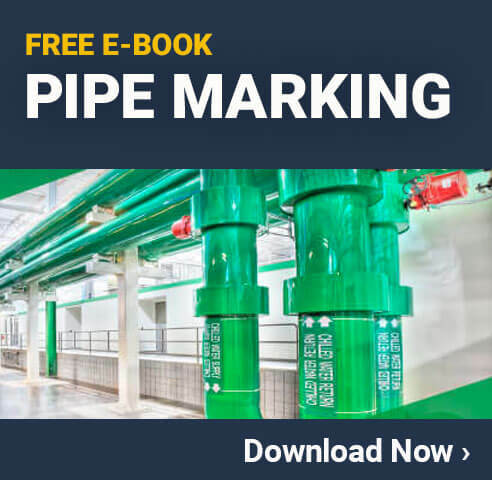 Read to learn the 5 steps to prepare for your pipe marking project.